Refugees marching to Austria: Hungary has denied access to trains. 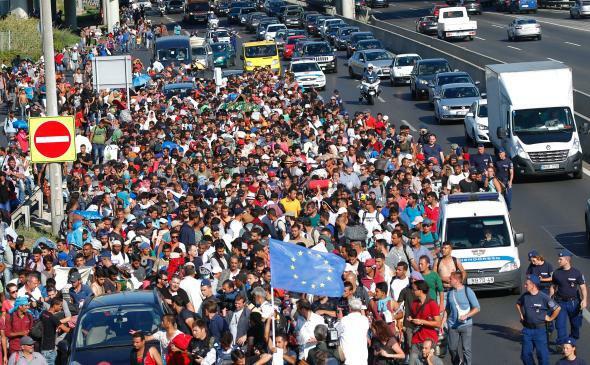 Refugees on the M1 highway from Budapest to Austria. Update, 3:50 p.m.: Hungarian authorities will provide buses to take the marching mass of refugees to the Austrian border, reports say. While move would seem to violate the letter of EU rules requiring that asylum cases be processed in the first EU country that the asylum-seeker reaches, it also seems like a more humanitarian solution than stopping 1,000-plus tired refugees by force and requiring them to register in a country they don’t want to stay in. It’s still not clear how Austria will respond to the group’s attempted entry, though. Original post, 12:43 p.m.: An estimated 1,000 refugees from countries including Syria, Iraq, and Somalia are attempting to walk 150 miles from Budapest to Vienna after being refused access to train travel, multiple outlets report. Refugees and migrants are arriving in Hungary by the thousands, many via Serbia. Many of those refugees have made it to Budapest. Hungary is an EU member nation (Serbia is not), and EU member nations are obligated to register and temporarily detain refugees that arrive in their country (rather than letting them pass through to other EU member nations). The refugees would like to get to Germany, which is more prosperous and liberal than Hungary. But Hungary’s not supposed to let them move, so it’s not letting them on trains. 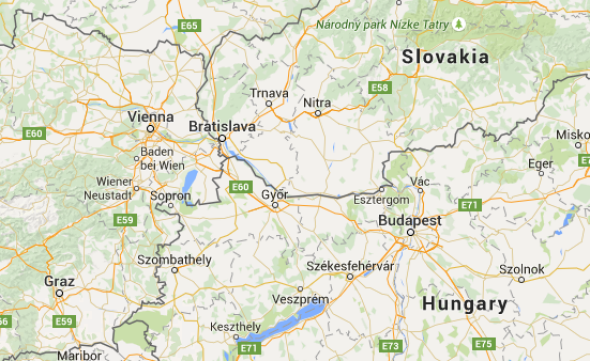 Budapest is 110 miles from the Austrian border and 150 miles from Vienna via the M1 motorway. Vienna is one step closer to Germany for the refugees. A different refugee group, estimated by the AP as at least 200 people, surged off a stopped train and past police in the northern town of Bicske. That group is also heading for Austria. Meanwhile, “thousands of Hungarian soldiers are in the process of building a fence on the Serbian border intended to keep migrants out,” the New York Times reports. The M1 is labeled above as part of European route E60.